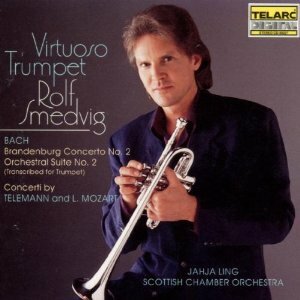 Rolf Smedvig showcases his dazzling virtuosity in this recording. He has been acknowledged as a soloist and chamber musician of international renown. In this recording he performs works by J.S. Bach, G.P. Telemann and Leopold Mozart. The Seattle Times wrote that this recording ensured Smedvig’s position in “that rarified arena of the few brass players who can sustain a solo career.” Jahja Ling conducts.